What Can I Put in My Oven to Prevent Spills? Your sizzling roast or scrumptious pie in the oven can fill your home with mouthwatering aromas -- unless the food overflows and drips on the oven rack or bottom. Suddenly, those delicious smells are replaced by acrid burning stenches. Prevent your kitchen mishaps from smelling up your house by taking steps to stop spills in your oven. Objects you likely already have around the house can get the job done, as can specially made products to stop spills. Not only will you stop spills from burning, but you'll keep your oven cleaner. Keep your oven clean by preventing spills from becoming baked-on messes. A simple sheet of aluminum foil can stop any spill from reaching the heating element of your oven and burning. There are two approaches to using foil. Line the bottom rack with a sheet of foil to catch anything dripping from above. This allows the air to flow unobstructed around the food being cooked above. 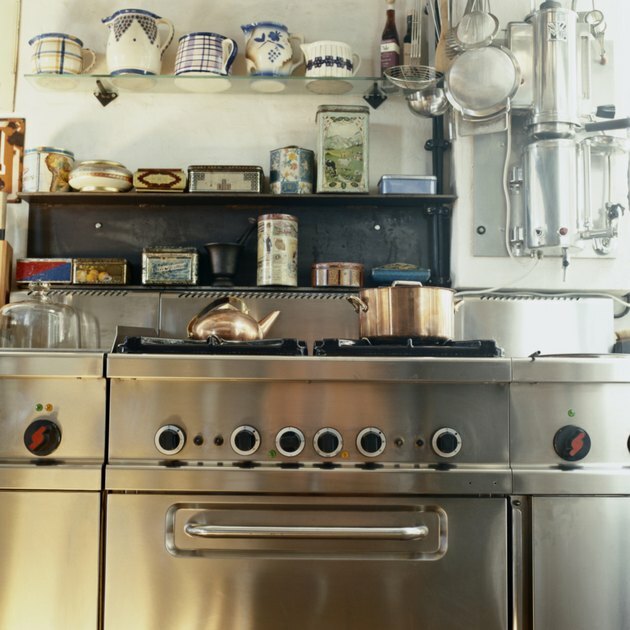 If you are using multiple racks, place the pan directly on a foil-lined racked. This does restrict air flow somewhat, so keep an eye on your food and adjust cooking times if needed. Replace the sheet of foil as necessary. As a second approach, add several inches to the amount of foil needed to cover the bottom of the pan. Let the extra amount stick up around the pan to catch bubbling food before it spills into the oven. A cookie sheet works in the same way as foil, but may work better for more heavy-duty spills. Place a cookie sheet on the rack beneath the rack holding the food, positioning it so it's able to catch any spill. Or, put the pan holding the food directly on the cookie sheet. This will work as long as the food pan is smaller than the cookie sheet. Resting the food pan on the cookie sheet can cook the bottom of your food quicker since it's exposed to a constant source of heat during baking, so keep an eye on the cooking times. Spill catchers are manufactured products designed to catch oven spills. Some spill catchers are designed with a raised, hollow circle in the middle, something like a flat Bundt cake pan. The food pan sits on the circle, so air can still circulate under the pan. Drips are caught in the rest of the catcher during cooking. Models that are covered in nonstick surface usually are easier to clean, as most burnt-on spills should come off with relatively little hassle. Look for spill catchers in home goods and kitchen stores. Oven liners are designed to sit on the bottom of the oven. For electric stoves, place under the heating element. They prevent spills from reaching the bottom of electric ovens and getting baked on, although spills can still hit the heating element and burn there. Check with the manufacturer whether the liner can be used for gas stoves. If so, cut the liner so it doesn't cover any vents that bring heat into the oven or place it on a rack instead. Different oven liner models may offer a nonstick surface or be dishwasher safe. The easiest way to stop oven spills is prevention. Cook food in an appropriately sized pan that leaves room for it to expand, in the case of baked goods, or for juices to stay contained, if you're cooking meat. Will Aluminum Foil Hurt My Oven As an Oven Liner?